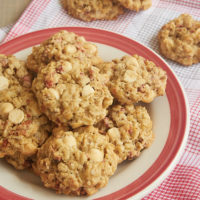 Strawberry White Chocolate Oatmeal Cookies are filled with lots of white chocolate, sweet strawberries, and plenty of oats. They’re sweet, chewy, and downright delicious! 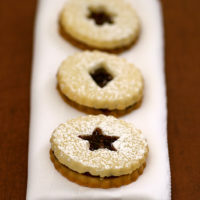 As much as I love to bake with berries, they don’t always work that well in cookies. All that moisture from those berries can really wreck a cookie dough. That’s where freeze-dried berries come into the picture. 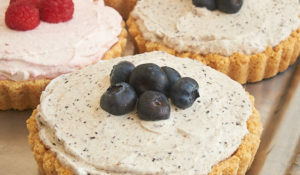 I first baked with freeze-dried berries a few years ago, but they weren’t easy to find. Now they’ve become more prevalent, and I’ve found that I really enjoy using them in baking. (Look for them alongside the dried fruits.) 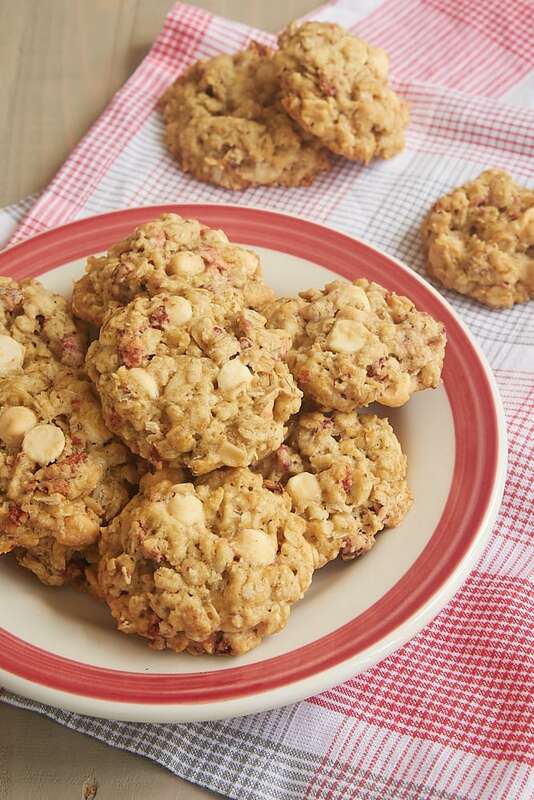 Using freeze-dried strawberries in these Strawberry White Chocolate Oatmeal Cookies means you get plenty of sweet strawberry flavor while maintaining a good, sturdy cookie texture. That’s winning, my friends! While white chocolate is not my first chocolate choice in general, there are times when it is the perfect choice. These cookies are a good example. Strawberries and white chocolate are a dreamy combo, and the sweetness of both really works well here. Of course, some of you may prefer dark chocolate with your strawberries. If so, then feel free to use dark chocolate chips instead of white chocolate. So, let’s talk a little more about those freeze-dried strawberries. I look for ones that are just strawberries, with no extra sweetener or other ingredients. They’re literally just strawberries. 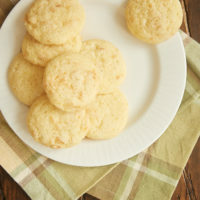 They are shelf-stable, which makes them a great addition to your baking pantry. You can rehydrate them if you like, although the flavor and texture won’t be quite the same as a fresh strawberry. For me, their main use is for baking. In these cookies, I roughly chopped them to get little bits of strawberry throughout the cookies. 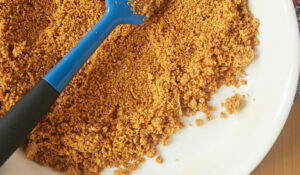 They can also be ground into a powder to use in lots of recipes to add flavor and color. If you aren’t able to find freeze-dried strawberries, then try dried strawberries. 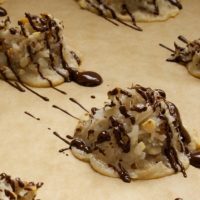 The flavor and texture will be a little different, but I think you’ll still end up with a pretty darn good cookie. 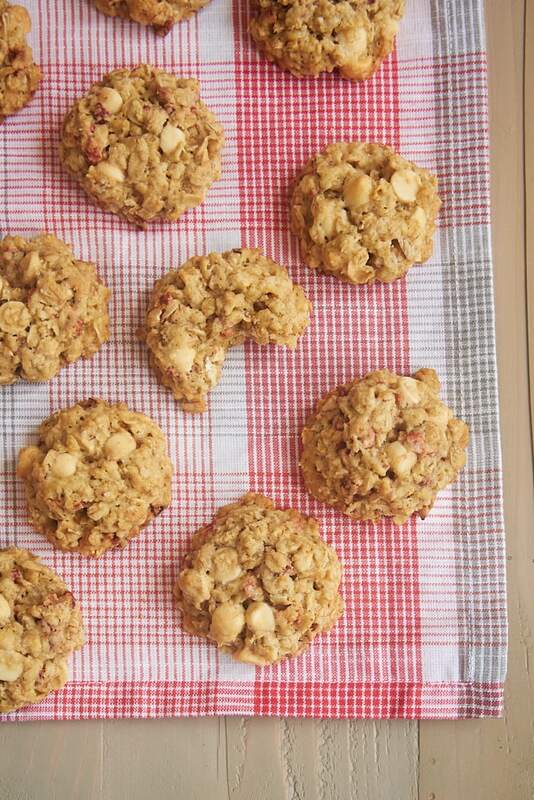 I absolutely adore these Strawberry White Chocolate Oatmeal Cookies. The sweetness of the berries and chocolate and the chewiness of the oats make them completely irresistible. If you’re looking for a great way to incorporate strawberries into a chewy, hearty cookie, then I hope you’ll give these a try! 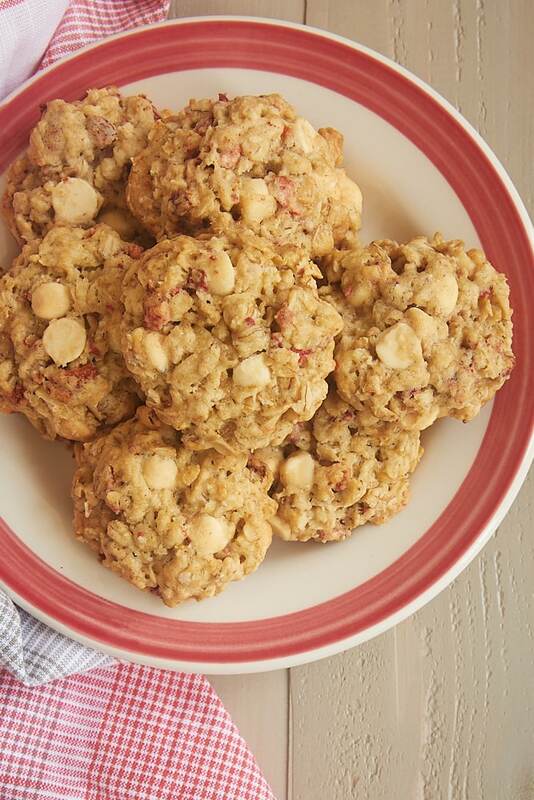 Strawberry White Chocolate Oatmeal Cookies have plenty of strawberry flavor thanks to freeze-dried strawberries. Add in lots of white chocolate and plenty of oats, and you’ve got a pretty fantastic cookie! 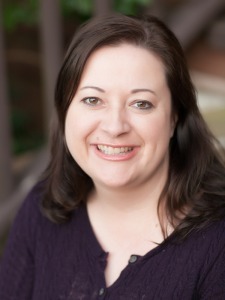 Whisk together the flour, baking powder, baking soda, and salt. Stir in the oats. Set aside. Stir in the strawberries and white chocolate. Refrigerate the dough for at least an hour. 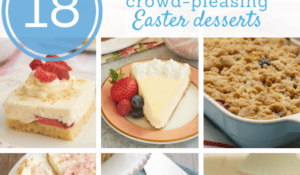 Drop the dough by 2-tablespoon portions onto the prepared pans. (A 2-tablespoon cookie scoop works wonderfully for this.) Slightly flatten the top of each cookie. 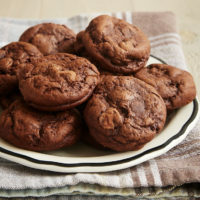 Bake 12 to 15 minutes, or until the edges of the cookies are browned. Cool the cookies on the pan for 5 minutes. Then transfer the cookies to a wire rack to continue cooling. I could live on white chocolate. If I can find the freeze dried strawberries I’ll definitely make them. Yum! 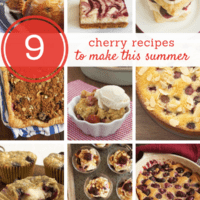 You could also use raisins or cranberries, they might be easier to find. I baked these yesterday with the freeze dried strawberries. Yum! They turned out great. In the list of ingredients is 1/2 cup of granulated sugar. However, it is not included in step #2 of the directions. I added it with the brown sugar. My little nephews came to visit and loved the cookies. 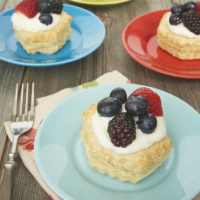 I will be sharing this recipe with their mom and definitely be making these treats again myself. I’m glad you liked them, Marge! Thank you so much for pointing out my omission of the sugar in the directions. I’ve updated the recipe. I made these yesterday with a dried berry mix: cranberries, blueberries, cherries, and a few dried strawberries. They are yummy!